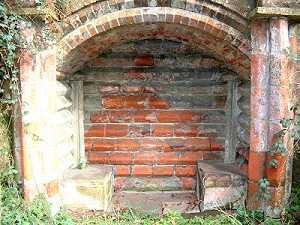 This unusual structure is set into the embankment on the east side of the A145, just north of the A145/A12 junction near Blythburgh. Located approximately halfway between Blythburgh and Bulcamp (grid ref: TM450762) it perhaps gives the appearance of an uncomfortable bus shelter. However, as it is believed to date from the mid-1800s the wait for a bus would surely have proved intolerable and may account for the belief that it is haunted. 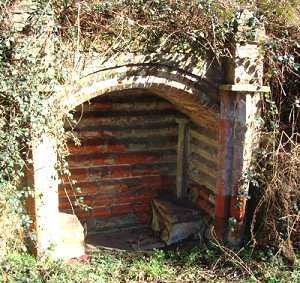 Another suggestion is that it was indeed a shelter, but for those whose journey to the nearby Bulcamp Workhouse (a 'House of Industry' dating from the 1700s, now a private residential complex) meant that their arrival was after the House had closed for the night. Surely though, this structure is much too small to linger in. Perhaps clues to its purpose lie in references to the Tollgate, or Turnpike, Cottages which stood nearby, just down the hill, but on the opposite side of the road. Was the structure in some way associated with the Turnpike road? Or again, perhaps it should be noted that the land lying behind the structure is named 'Springhill', and, on a walkers' map, this stretch of road is named 'Springhole Lane'. Perhaps the structure marks the site of an ancient spring, now no longer in evidence.